Today marked the end of the first trimester at our school. It was also the end of the month and time to celebrate November birthdays. 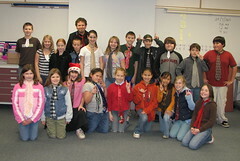 The school had a 'tie day' to encourage school spirit. We of course rocked out at our now infamous IMA monthly party. The down side of this academic milestone is that I will be spending most of this weekend working on report cards.